Aloe vera eases, through its anti-inflammatory and healing effects, a wide variety of sports injuries and troubles, including swelling and pain in joints, soreness of muscles, tendonitis, bursitis, strains, sprains, bruises including bone-bruises, cramps, skin irritations, including shoulder-pad irritation, and bra-bum, burns, blisters, itching and sunburn. In the less frequent conditions of injury which involve deep trauma and in which surgery may have to be used, Aloe vera also soothes inflammation, eases pain and promotes repair of the injury. Many of the injuries and physical problems which occur through sports are relatively minor, in the sense that they will right themselves anyway within a certain reasonable time span and do not entrain the threat of any continuing disability. Nonetheless, they may give rise to much discomfort and pain in the shorter term, together with the obvious disadvantage of non availability for future events. If, indeed, one is passed as fit, one may suffer discomfort during the events and lose performance. Every trainer or sports physiotherapist knows, therefore, that treatment for each sports injury that arises poses a challenge to his or her skills to minimize discomfort and pain, to accelerate healing and to ensure that healing occurs in a favourable fashion which does not prejudice future performance. In the fortunately few cases where sports injuries are more serious they may involve broken limbs and collar bones, blows to the head with concussion, damage to eyes, mouth or teeth, blows to the body with likely damage to internal organs, and sometimes severance and penetration of deeper tissues. Many of these will involve corrective surgery and all will involve long term absence from the sporting events. In these cases the complete necessity for hospital treatment may for a time exclude the athlete’s or sportsperson’s usual trainer or physiotherapist from close involvement in deciding the treatment. Even then, the opportunity is likely to arise to influence the recuperative stages and the process of recovery from surgery after discharge from the hospital. The chance should also be there to offer natural remedies to help induce the more rapid healing of broken bones. fungal infections, turf burns, blisters, itching and sunburn. The properties of Aloe vera which are relevant to these conditions are the antiinflammatory effect and the healing action. All of these forms of local tissue damage give rise to inflammation in the affected area. With this inflammation there is always discomfort, tenderness, soreness or pain, often irritation and very frequently swelling. The first priority is most frequently to relieve these discomforts and reduce any swelling that may have occurred. There is also a clear suggestion in the literature that Aloe may have a direct ability to alleviate pain which is separate from its ability to alleviate inflammation. This would be an analgesic effect as opposed to the antiinflammatory effect which reduces pain indirectly through relieving inflammation. This is suggested by the paper of Gupta, Singh and Singh (1981) which, though I regret the mention of it may dismay many readers – quite understandably so – used “the rat tail hot wire method” and showed that Aloe exerted an analgesic effect at the very time of inflicting the pain. This was clearly distinct from relief of inflammation because inflammation takes a measurable time to develop following an injury. Thus, injured athletes and sportsmen and women, treated with Aloe, may well benefit from this distinct pain-relieving action. This separate favourable action of Aloe seems likely to augment the benefits of direct action upon the swelling and other effects of inflammation. I am acutely aware that animal experiments deeply disturb most people in the Alternative field and stress that I do not sympathise in any way with such work. Since all the commonest conditions found associated with sports injuries involve tissue damage, then inflammation is always present, which results in a major part of the discomfort, pain and relative immobility. Since Aloe is an anti-inflammatory agent par excellence, and also possesses healing powers as well, this tends to leave Aloe virtually unrivalled for the treatment, alleviation and healing of these conditions. The Table below lists the different common sports troubles that have been mentioned and pinpoints the main relevant actions of Aloe which apply in each case. Literature references to the anti-inflammatory properties of Aloe have been listed in Issue 2 of these Newsletters and those to the wound-healing properties are in Issue 4, to which reference should be made. In the less frequent conditions of injury which involve deep trauma and in which stitching may be required for lacerations and surgery, Aloe vera soothes inflammation, eases pain and promotes repair of the injury. As this may be fairly rare in the context of sports injuries, it can be fairly stated that Aloe obviously possesses the properties required for the alleviation of surgical trauma generally. The Aloe literature shows that it has been applied to relief of surgical wounds from dentistry and from otolaryngeal (ear, nose and throat) operations, but there is no reason at all why this same principle should not be applied across the entire scope of surgery, including all abdominal and chest operations where major trauma occurs through incisions made through the body wall. The first priority in applying Aloe vera to the alleviation and treatment of any of the above problems is usually to get a fully active preparation of Aloe vera into close contact with the surface of the affected part, to leave it in contact and to do anything possible to work it into the skin and promote penetration. In Newsletter Issue No 5 it has been explained that certain distinct advantages attach to using Whole Leaf Aloe vera Concentrate. This is still very much this author’s choice at the time of writing this Newsletter No 10. There are forms of Aloe vera Concentrate under development at the present time which may eventually claim even further advantages if they are brought to fruition. If this ever comes about, the Aloe vera Information Service intends to publish fully about it. Therefore, a very basic important treatment consisting of saturating a gauze in Whole Leaf Aloe vera Concentrate, wrapping the area thoroughly with it and keeping it in contact for 30 to 60 minutes. Alternately, if the trainer or physiotherapist is in any case wanting to apply ice to the area, a towel can be saturated with Whole Leaf Aloe vera Concentrate and also packed with ice. In either case, when the gauze or towel shows signs of drying out it should be re-soaked and re-applied. It is often the very best approach to use this very simple method. The Concentrate is always most likely to have its maximum effect when it is used undiluted and without any additions, so that the active components of Aloe vera contact the tissues in the highest possible concentrations. The direct use of the unaltered Concentrate is entirely appropriate in cases of acute strains, sprains, bruises and cramps, pain and soreness in muscles, tendons and joints, swelling and inflammation anywhere and in skin irritations and abrasions. However, there are times when it is more convenient to use a preparation which has some added viscosity. The Whole Leaf Aloe vera, notwithstanding its polysaccharide content (often mistermed mucopolysaccharide) does not possess significant viscosity. Therefore, unless it is applied as described above, held within the fibres of a cloth, it will just run off the skin. Whenever it is not appropriate to use a cloth, a lotion with some ‘body’ can be made up using glycerine. A10% addition of glycerine will give some thickness, a 20% addition will give more. This type of lotion is then applied liberally to the area and rubbed in, followed by more effective massage for 5 to 10 minutes after each application. This procedure is repeated 4 or 5 times per day. This approach is appropriate to use as the first step, but is often best used as a follow up to a period in which the other approach has been used, employing saturated cloths. Bursitis, tendonitis, muscle soreness, joint pain and conditions involving swelling can all be treated in this way. Aloe vera is well noted for its powers of penetration, but this is greatly assisted by the rubbing-in action and the subsequent massage. The slightly thickened lotion may also be used as an effective contact medium for ultrasound treatment, as often used by physiotherapists. There are also products available which are sold as a thickened product. These may be referred to as a ‘Jelly’ or, being American, ‘Gelly’ or ‘Gel’. The last term should not be confused with the usual meaning of Aloe vera Gel proper – used in the sense of being a fluid extract derived from the ‘filet’ of the inside of the leaf. The Aloe content in such product can be either Gel in this sense or Whole Leaf Aloe vera. These thickened preparations are very practically useful in the treatment of sports injuries as they are suitable for applying Aloe in a way which permits contact to be maintained over a prolonged period. They still have to be applied to the area in adequate amounts and worked in enough to ensure thorough contact. They are suitable for treating sunburn, all types of itching and irritation, skin infections, including fungal infections, blisters and turf bums. It really is most important, however, that the practical advantage of a thickened preparation is not gained at the expense of lost potency. Some preparations of this type on the market contain pitifully small amounts of Aloe vera, being mostly thickening agents and fillers. They may also carry misleading labels. For example, “made with 100% Aloe vera” can legally apply even if only 1% by weight of ‘100% Aloe vera’ has been incorporated into the product. In fact, the meaning of the term “made with” is very loose. Strictly speaking, in making a fruit drink, ‘made with fresh oranges’ can just mean that there were some fresh oranges present in a nearby part of the factory when it was being made. Therefore it is important that one checks out what proportion of the thickened product is really composed of Aloe vera Extract. 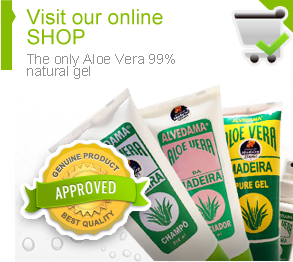 The very best products will contain about 75 to 80% of Aloe vera Extract by weight. Any claim on such a product that the content is 100% cannot be true because there would be no room in the product for any thickening agents or preservatives. This author has found no medical studies on sports injuries and Aloe. That is probably because such studies would be inherently difficult to arrange. Sports injuries occur sporadically to individual sportsmen and women and the injuries themselves are highly individual. Instead, the literature contains assorted accounts of individual cases from people who were engaged in work as trainers or physiotherapists, generally in America, and reported in various American publications, such as those of Mr Bill C. Coats and others. One is an account of a man with a badly swollen and inflamed foot which he had not been able to treat successfully with any conventional methods. He then decided to apply a thickened Aloe vera lotion to his foot, following the instructions carefully, applying it generously to both foot and ankle.generously to both foot and ankie. Within a few minutes he noted that the considerable pain had already gone. After getting ready and going out he recognised that all the soreness and pain had truly disappeared, even when he put weight onto the foot, and he was not impeded at all, being able to walk normally wherever he wanted to go. Another case was of a female runner who had entered her race knowing already that she had some trouble with an ankle. During the race it got much worse, until suddenly something slipped or ‘popped’ in her foot, almost disabling her. By dint of great will power she had managed to finish, but was then brought in from the field writhing in agony on a stretcher. Aloe vera Extract was applied to the ankle by means of generously soaked gauze for 30 minutes and then a thickened lotion was applied to the area and worked in by gentle massage. The record states that she was able to walk fairly freely again on the ankle within about 45 minutes. it is also recorded that in one incident at a the Olympic Games in Montreal, four Russian athletes were suffering from Achilles tendon problems. This is a very disabling state which nearly always puts athletes and sports people right out of their sport for a time. All these athletes were expecting only one thing – to be left out of their events after having travelled across the world to participate, with all the accompanying disappointment and frustration. These four were then treated with Aloe vera Extracts and Gels according to much the same principles as already described and the condition of their injury improved dramatically so that they were, after all, able to take part in their events. The end result was that three of the four won Gold Medals and the Soviet Olympic Committee invited the American trainer who did the job to Russia to demonstrate the methods he employed. All the above methods for the application of Aloe vera products to injuries have adopted topical, or surface application. This is very often the best way to treat a local area. In some of the cases reported the response was amazingly quick, showing such a degree of effectiveness that, apparently, no other means of application was needed. However, in cases where the alleviation and healing processes are rather longer term, it is usually best to administer Aloe vera Whole Leaf Concentrate by mouth as well as applying it topically. There is no doubt that it is beneficial to work from within as well as from without, even if the condition is quite superficial. If it is deeper, as is the case with joint and muscle problems, then these tissues can certainly be treated via their blood supply very effectively, indeed, in the mid to longer term. Therefore, wherever treatment with Aloe is going to last for more than half a day, internal, as well as external use is advised. Copyright Alvedama 2019. All rights Reserved!